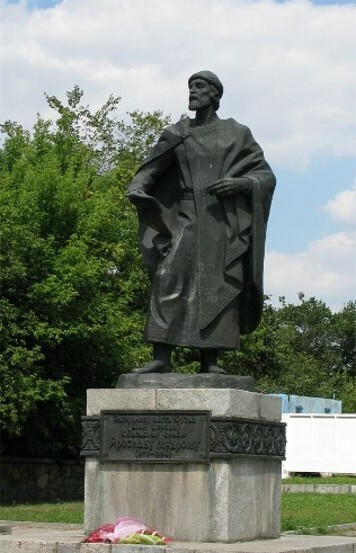 Yaroslav the Wise [Jaroslav Volodymyrovyč ‘Mudryj'], b 978, d 20 February 1054 in Kyiv. 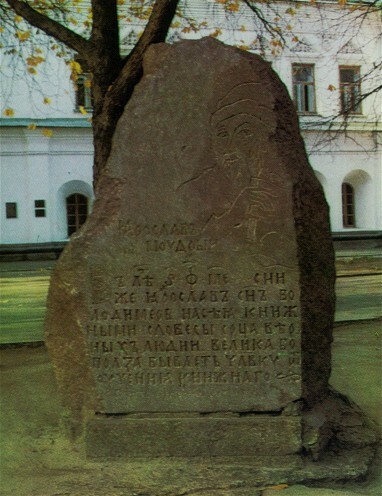 Grand prince of Kyiv from 1019; son of Grand Prince Volodymyr the Great and Princess Rohnida of Polatsk; half-brother of Sviatopolk I, Mstyslav Volodymyrovych, and Saints Borys and Hlib; father of seven princes, including Iziaslav Yaroslavych, Sviatoslav II Yaroslavych, and Vsevolod Yaroslavych. During his father's reign Yaroslav governed the lands of Rostov (from ca 988) and Novgorod the Great (from 1010). While ruling Novgorod, which became his main power base, he rebelled against his father by refusing to pay the yearly tribute of 2,000 silver hryvni (see Hryvnia) to Kyiv. His father died in 1015 while preparing an expedition to subdue Novgorod, and after his death Yaroslav waged war against his brother Sviatopolk I for the Kyivan throne. He defeated Sviatopolk and his Pecheneg allies (see Pechenegs) at the Battle of Liubech in 1015 and assumed the title of grand prince . In 1018, however, Sviatopolk and his father-in-law, Bolesław I the Brave of Poland, defeated Yaroslav's army at the Buh River and drove Yaroslav from Kyiv. In 1019 Yaroslav and his Novgorodian army routed Sviatopolk at the Alta River and regained the Kyivan throne. To retain his authority in northern Rus’, in 1021 Yaroslav fought and defeated his cousin Briachyslav Iziaslavych of Polatsk, thereby gaining his loyalty. 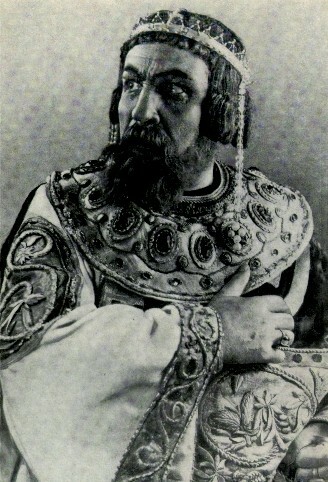 Yaroslav's half-brother Mstyslav Volodymyrovych of Tmutorokan and Chernihiv, who was vying for control of southern Rus’, proved to be a more stubborn opponent. After being defeated by him at Lystven, near Chernihiv, in 1024, Yaroslav was forced to cede to Mstyslav all of Left-Bank Ukraine except Pereiaslav principality. An accord between them was reached in Horodok in 1026, and Yaroslav assisted Mstyslav in his 1029 campaigns against the Yasians and Kasogians, thereby extending his realm to the Caucasus Mountains. Mstyslav in turn helped Yaroslav consolidate his power west of the Dnieper River. In 1030 Yaroslav conquered lands between Lake Peipus and the Baltic Sea and founded there the city of Yurev (named after Yaroslav's Christian name, Yurii-Georgii), now Tartu in Estonia. In 1030–1, with Mstyslav's help, he regained the Cherven towns from Bolesław I the Brave and annexed the Polish-ruled lands between the Sian River and the Buh River, where he founded Yaroslav (now Jarosław). After Mstyslav Volodymyrovych's death in 1036, Yaroslav annexed his lands and became the unchallenged ruler of Kyivan Rus’ except the Polatsk principality, which remained under Briachyslav. In 1038–42 he waged successful campaigns against the Lithuanian Yatvingians, Mazovia (as the ally of his brother-in-law, Casimir I of Poland), and the Baltic Yamians and Chudians. In 1043, however, his military expedition against Constantinople, led by his son Volodymyr of Novgorod the Great and the chiliarch Vyshata, ended in disastrous defeat. To defend his state from the attacks of nomadic tribes, Yaroslav fortified the southern frontier by building along the Ros River, the Trubizh River, and the Sula River the towns of Korsun, Kaniv, Pereiaslav, Lubny, and Lukoml and lines of ramparts, castles, and outposts. In 1037 he routed an army of Pechenegs that had attacked Kyiv, and initiated construction of the Saint Sophia Cathedral to commemorate his victory. During Yaroslav's reign the cities of Kyiv, Novgorod the Great, Chernihiv, Pereiaslav, Volodymyr-Volynskyi, and Turiv were considerably transformed. Over 400 churches were built in Kyiv alone, which was turned thereby into an architectural rival of Constantinople. Yaroslav's walled inner city in Kyiv covered an area of nearly 60 ha. It was entered through the Golden Gate, Polish Gate, and Jewish Gate, and the Saint Sophia Cathedral stood in the center, encircled by large palaces. 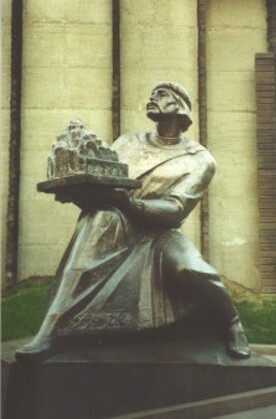 To strengthen his power and provide order in social and legal relations in his realm, Yaroslav arranged for the compilation of a book of laws called ‘Pravda Iaroslava’ (Yaroslav's Justice), the oldest part of the Ruskaia Pravda. During his rule Christianity spread and grew stronger in Rus’ (he actively suppressed paganism), and the organizational and hierarchical structure of the Rus’ church was established (see History of the Ukrainian church). 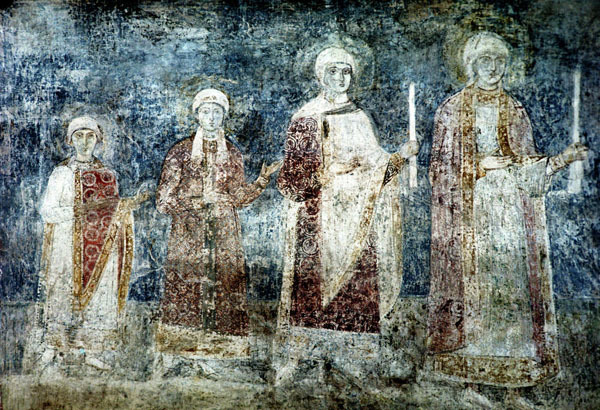 In 1039 the existence of the Kyiv metropoly was confirmed in writing as being under the jurisdiction of the Patriarch of Constantinople. Yaroslav issued a statute defining the rights of the church and clergy. Apart from Constantinople's right to confirm the appointment of the metropolitan, the Rus’ church was autonomous, and in 1051 Yaroslav initiated the sobor of bishops that chose Ilarion as metropolitan of Kyiv (see Metropolitan Ilarion). The first monasteries in Rus’ were formally established during Yaroslav's reign. He founded a primary school and library at the Saint Sophia Cathedral and sponsored the translation of Greek and other texts into Church Slavonic, the copying of many books, and the compilation of a chronicle (1037–9) (see Chronicles). 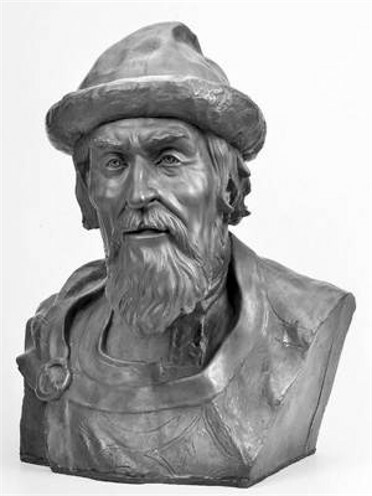 Yaroslav strengthened the international role of Kyivan Rus’ through dynastic unions. He married Ingigerd, the daughter of King Olaf Skötkonung of Sweden, and arranged marriages for his daughters Yelysaveta Yaroslavna, Anna Yaroslavna, and Anastasiia with Kings Harald III of Norway, Henry I of France, and Andrew I of Hungary respectively. His son Iziaslav Yaroslavych married Gertrude, the daughter of Mieszko II of Poland; Vsevolod Yaroslavych, the Byzantine princess Maria, of the Monomachus line; Sviatoslav II Yaroslavych, the granddaughter of Emperor Henry II; and Volodymyr, Oda, the daughter of Count Leopold von Stade. The monarchs Olaf II Haraldsson and Harald III of Norway and Edmund II Ironsides of England sought asylum at Yaroslav's court, and he concluded alliances with Emperors Henry II, Conrad II, and Henry III. During Yaroslav's reign the influence of the Varangians was limited exclusively to the military; administrative and governing functions were assumed largely by indigenous viceroys (eg, Vyshata, I. Tvorymyrych, Dobrynia's son Kosniatin [Kostiantyn]). As a European power Kyivan Rus’ reached its zenith under his rule. 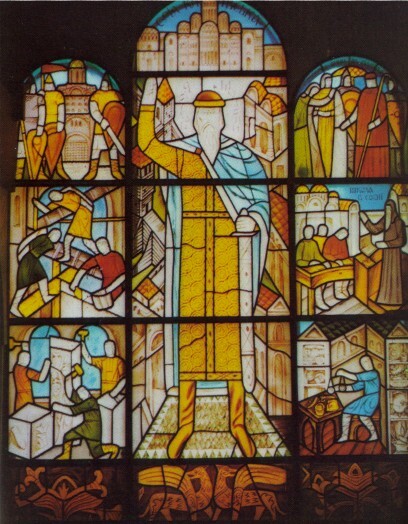 To ensure the unity of his state, Yaroslav introduced primogeniture, according to which his eldest living son, Iziaslav Yaroslavych of Turiv, was to succeed him as grand prince and ruler of the Kyiv and Novgorod lands; Sviatoslav II Yaroslavych would rule the Chernihiv land to Murom, and Tmutorokan; Vsevolod Yaroslavych, the Pereiaslav and Rostov lands; Ihor, the Volodymyr-Volynskyi land; and Viacheslav, the Smolensk land. As a result Kyivan Rus’ would never again be united. Yaroslav was buried in the Saint Sophia Cathedral, where his marble sarcophagus has been preserved. A referral to this page is found in 79 entries.